Blog articles tagged with "ssl" - focus. Bespoke Web Development, Digital Marketing & Web Design, Bristol & Hertfordshire. With 2017 seeing Google continue their campaign against insecure web sites (read my blog to find out more), we thought this was a good opportunity to look behind the abbreviations and discover what SSL and HTTPS mean and the impact they have on everyday web site visitors. 1. SSL stands for ‘Secure Sockets Layer.’ In layman’s terms, this is a secure way of sending information over the Internet. Any data transferred 'over SSL' - such as web page content from a server to your browser - gets encrypted prior to being sent over the web for viewing. 2. Many websites use SSL for secure areas of their sites, particularly user accounts and online checkouts. As information is encrypted, the theory is that even if someone unwelcome gets hold of it, they'll be unable to do anything with it. 3. SSL is applied to your website – or parts of your website – by way of a digital certificate, which is purchased and added to your domain to demonstrate its security to users. It also ensures any content from that domain is encypted. 5. SSL keeps personal data such as your name, address or credit card information between you and the merchant who you are sending it to. 6. If you want to find out more information about a site’s security, by clicking the ‘i’ icon, or right-clicking the padlock, you can get more details. 7. Like everything in life, there's a wide range of SSL certificates available and they vary in features and price. Some are free but will require ongoing administration, others are more expensive but offer the tightest security including the strongest encyption algorithms and verification checks. SSL is likely to be a hot topic in 2017 with Google's planned warnings for insecure web sites. If you’d like to know more about SSL, securing your site and how to get an SSL certificate, please get in touch. Google are big believers in HTTPS and SSL - they've been focused on making the web 'more secure' for all of us for some time now. One way in which they do this is to prioritise secure web sites in their search results, and another is showing a site's security status in the address bar within their native browser, Chrome. 2017 will see Google continue this campaign with some significant new features. 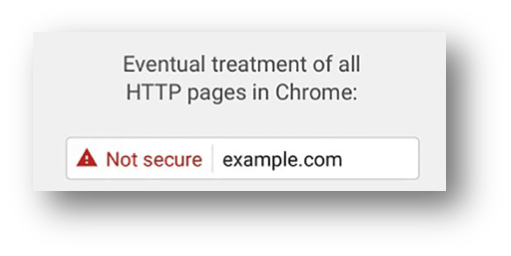 Early in the year, Chrome will start to display additional security warnings for specific pages on web sites that are not secure – so HTTP, not HTTPS. These warnings will be fairly stark, as shown, and a s you can imagine, not the most reassuring sight for a visitor to your web site. As time passes, Google have said that their criteria will gradually become stricter and the warnings will also be added to all non-secure pages - the aim is, by some point in 2017, to mark all HTTP sites as ‘non-secure’ with a red security indicator. This is likely to have considerable impact. Google Chrome currently accounts for 47% of all UK web users, so these warnings are going to be seen by a lot of people. Equally, Google will continue to rank non-secure sites lower in their search results. And history has shown that what Google does, others follow, and we're likely to see a similar approach adopted by other browsers such as Safrari, Firefox and Internet Explorer. Web site owners who have or do not move to SSL will suffer not just the effect on web traffic and performance, but there is a risk to jeopardising customer trust. If your website does not yet have SSL / HTTPS, or you’d like to know more about how to make your website more secure – and therefore more favourable with Google – please get in touch. Google’s official article about these changes is available on their blog. You may also like to read my blog which explains what SSL and HTTPS really means. It's estimated that Heartbleed affected about 17% of all secure websites at the time of its announcement, and it's a bad issue - it theoretically means that someone can read secure SSL-protected data. First of all, from a This Is Focus viewpoint, we can confirm that only a very small number of sites we host were ever affected, and those were upgraded within a few hours of the fix's availability - meaning that they're no longer vulnerable. Remember, this issue only affects you if you're running an https:// (SSL) website. So what does Heartbleed mean? Without going into too much technical detail, it effectively means secure websites were potentially only as secure as non-secure websites - an attacker could see details passing between you and the website whilst they were "in transit" between them. That's still fairly secure, to be honest - an attacker couldn't see your password unless they were either on the same network as you, your website, or somewhere in between. If you're on your own network (and not, say, on public WiFi), it's still difficult to achieve for a casual attacker - it's only practical for serious, large-scale attackers. So in summary, everyone should have applied these fixes by now - we have, and all the sites mentioned above have - but it's worth asking/checking if you rely on the security of any other sites. And this could be a good reminder to change your passwords!